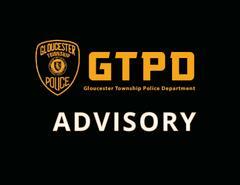 On Thursday, March 14, 2019 at approximately 4:01 pm Gloucester Township Police responded to the front of the Gloucester Township Municipal Building after a motor vehicle crash occurred on Chews Landing Road involving a motorcycle. The driver and passenger of the motorcycle were ejected onto the roadway but were both conscious and alert. Officers closed Chews Landing Road and provided initial medical care to the occupants of the motorcycle. The driver of the second vehicle was not injured. Gloucester Township Fire and EMS worked with Virtua ALS to render medical aid to both occupants of the motorcycle who were transported to Cooper Universality Hospital with non life threatening injuries. This crash is being investigated by the Gloucester Township Police Department's Traffic Safety Unit. Chews Landing Road, between Hider Lane and Little Gloucester Road, was closed for approximately one and a half hours during the initial phases of the investigation. The names of the parties involved are not being released at this time pending further investigation. If anyone witnessed the crash or has any information related to it please contact the Gloucester Township Police Department at 856-228-4500 or at our GTPD Anonymous Tip Line at 856-842-5560. To send an anonymous tip via text message to the Gloucester Township Police please text the keyword "TIPGLOTWPPD" and your tip message to 888777.